Jeff Wells gave me a heads up to visit this room, and I'm glad I did. 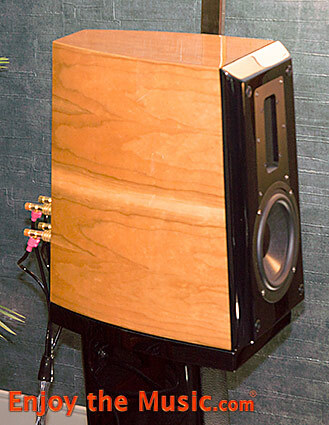 Roger DuNaier, President of audiophile-direct, informed me about Aurum Cantus' Italian roots, their Asian partnership in the mid 90's, and they make their own drivers that have found favor in many speakers, and are probably the largest speaker manufacturer we have never heard of. Ribbon drivers are a specialty; in fact AC is the largest single designer and manufacturer of ribbon tweeters in the world. 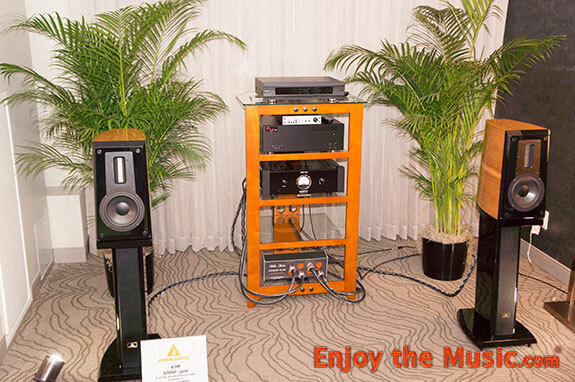 Roger had the Aurum Cantus V3M standmounts, ($2000 per pair including stands and shipping), on display and they looked like speakers 2 to 3 times their asking price. A Sound Science Music Vault Diamond server, ($4995), fed a Benchmark DAC2X DAC ($1995), a Wells Audio Majestic Integrated amp ($3599), and Dana cables completed the system. 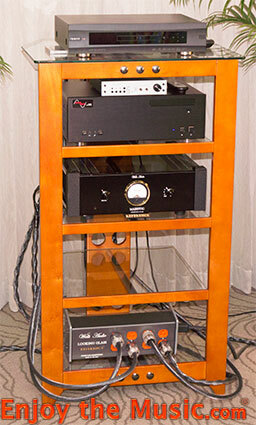 This was one of the very best values at RMAF, and the speakers perfectly suited the room, nice job Roger. I heard Aaron Neville sing "Everybody Plays The Fool" from Warm Your Heart, the cymbals sounded real, the background singers placed behind Aaron, and his voice was clear and focused. I also heard some Ry Cooder, and what I can say is all the other standmount speaker manufacturers better watch out, the V3Ms sound like they should cost double or triple the $2000 they sell for, and Aurum Cantus has a whole stable of floorstanders below $5000 with advanced performance over the V3Ms.